We like to take a walk on most holidays. And based on the number of people we see we're not alone. But it's rare that we got the weather we've had this Tbankgiving holiday. Sunny and in the 60s. Perhaps that explains the Common Buckeye we found at Schuylkill Center for Environmental Education yesterday. These butterflies are in fact common but we don't see them more than once or twice a year. Part of that is because we never go out with the primary intention of finding butterflies. When we do they're always a bonus, just like dragonflies. But both of them add to the pleasure of a day outside. And if you're able to see them magnified through binoculars you have to just stop in wonder. They certainly give birds a run for their money when it comes to aesthetics. This one in particular is gorgeous. If I were a photorealistic type of artist I'd try to render every color, every gradation of one color into another. But I just have never had any desire to paint in such a way. 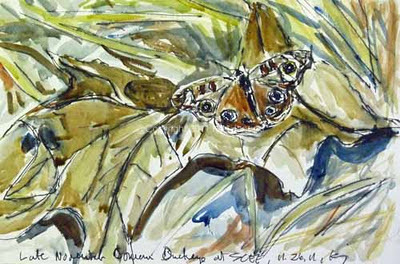 So this quick sketch of ink and watercolor tries instead to get a sense of the excitement of being outside, of seeing this beautiful butterfly perched on some oak leaves on the ground. I've seen a number of artists who've done a wonderful job of portraying butterflies in their environment, definitely not in the photorealistic style. One of the best is the late David Measures. Another is Barry Van Dusen with his own version of a Common Buckeye. Finally Bruce Pearson seems to do a wonderful job on whatever he sees outside! What i like about all of these is that they capture the excitement of being outside, of seeing nature outside. To me this is far more interesting and artistic than any photorealistic renderings. I wish I could say that my little sketch at top was done from life like the work of the artists I've just mentioned. I did one field sketch of this Common Buckeye but I also took some photos. This is based more on one of the photos than on the field sketch. But I'm working my way to doing more painting outside. Next year when the predictably warm weather returns I hope to have more to show along those lines. A number of factors have conspired to get me to try some very small linocuts. Part of it is a holiday show of smaller works at the Manayunk Roxborough Art Center, part of it is the lower prices I can charge just in time for the holidays, and probably part of it is just the lack of pressure on me when I do something small. In addition my plan is to hand color each print with a bit of watercolor. I guess the main reason for this is that I'd like the print to look something like the small watercolor and ink version of this I showed a week or two ago. Who knows how this will work. 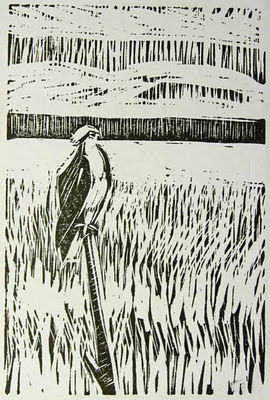 To see a masterly combination of linocut and watercolor look at the work of Andrew Haslen. 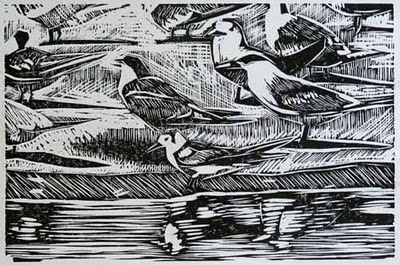 One of his prints was often shown in media coverage of the Society of Wildlife Artist's 'The Natural Eye' show that I was also in a few weeks ago. It reminded me of how much I like what he does with the combination. I'm afraid that I won't do anything very similar here though. Most artists seem to use linocuts to create the outlines of forms then use watercolor to fill in, though sometimes with a very sophisticated 'filling in.' But as usual I'm trying something different. There are very few outlines in this print, outside of the osprey itself. And the black ink and white paper will provide most of the fill color there. That just leaves the grasses, water, and distant grasses. So I'll just add a few colors in indistinct areas. That is similar to the watercolor so that's what I'm going for. It may not work at all. But that's the virtue of working so small. If it doesn't work I haven't lost much in the way of time or materials. So sometime after Thanksgiving we shall see what happens. And to be on the safe side I may just print a few with no added watercolor. 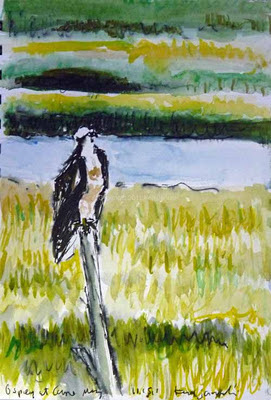 In between my field sketches and watercolor of ospreys, other field sketching, general birding, etc. 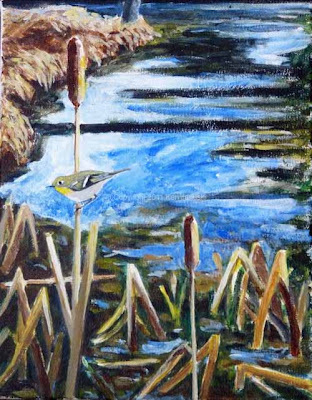 I've had two somewhat developed works: the ten terns lino, focused on the Black Tern in front, and my second acrylic painting in 25+ years, of the Ruby-crowned Kinglet in Cattails. I've had the luxury of letting them sit while I work on other things and decide if they're really done. I think that they are. Above is the Ruby-crowned Kinglet, 11x14 inches. This lino sat the longest. Like sculpture when you cut away on a linocut what you cut away is gone for good. You can't put wood back on a sculpture and you can't put linoleum back on the block. So inadvertently it's sometimes easy to go from a print that seems too dark to one that seems too light. I feared making this one too light, even though it was a very light scene to begin with. Finally I decided that I needed to lighten it up. I did that yesterday. I believe it's now done, though this is the type of thing you could probably fine-tune for weeks. All of the proofs have been with water-based inks. They are so easy to work with and cleanup, though the ink seems to disappear extremely quickly compared to oil-based inks. I'm still deciding whether to print the edition in oil-based or water-based ink. I know that the title of this post probably hints at a nasty joke at the expense of George Bush. I'm no fan of his but that's not the reason I titled it so. I try to stay away from politics here, not that I don't have very strong feelings and thoughts about it. But I don't believe readers read this for politics and so I don't want to do anything to scare them off, well at least most of the time. Occasionally I can't help myself. The reason I mention George Bush though really does relate to ospreys. I was trying to walk off the depression of his re-election on the day after the election in November, 2004. I was near Kitchen's Lane Bridge over the Wissahickon in Philadelphia. A huge shadow appeared in front of me and I looked up to see an osprey heading up the Wissahickon with a fish in his talons. I believe it was the first osprey I had ever seen there. It certainly was the latest. I had mentioned this to an accomplished Philadelphia birder about a month ago and he expressed some surprise. It seemed late for ospreys here. That was my thought when I saw it and when I saw subsequent ones along the Wissahickon in October of numerous years since then. Still there was no doubt what I was seeing. Yesterday Jerene and I went out to see if the immature Red-headed Woodpecker was still there. YES! Five weeks since I'd first found him. Since they bred here in the 19th century I do have to wonder if he might not stay. When I've seen him he's acted as though it's always been his home. As nonchalant as could be. When we first arrived at Wissahickon near Valley Green we heard some whistles I couldn't quite place. They seemed wrong for the squeaky whistles of Wood Ducks. But we couldn't find the bird. When we returned from our walk down to the woodpecker though a huge shadow went over our heads. A beautiful Osprey. He sat in a snag directly across from the Valley Green Inn for at least five minutes. Then he flew around the nearby bridge for another five minutes before heading down stream. I didn't decide to sketch him until just before he left. So the field sketch at top is really more from a visual memory of the bird I'd just seen than from actually looking at it and drawing it. The same is true of the bird as he flew downstream. This is definitely the latest I've ever seen an osprey at the Wissahickon. This type of sketch from memory is often wrong. I've not made his wings as long as they should be. But each time I do this I learn more. Eventually I'll have a pretty good sense of an osprey's shape before I try to draw the one that just landed in front of me, along the Wissahickon at a time he shouldn't be here. The watercolor at top is another done on Stillman & Birn Beta sketchbook. It has worked just fine for the washes and watercolor that I use. The ink is the same runny ink from a Bic pen that I've mentioned in the past. One of these days I'll have to explore a ballpoint pen whose ink does not run. For now I'm just using it to ease the way from a drawing to a painting. The painting is based on a photo and field sketch of osprey with punky looking head feathers seen in Cape May last August. One thing I forgot to mention, and it's kept nagging at me, is the emphasis on field work in much of the art of the Society of Wildlife Artists. I'm so used to it now that I forget that I take it for granted. But I just wanted to add that I think that's an essential ingredient to the liveliness of the art, at least wildlife and nature art. The ink and watercolor sketch above reminded me of this principle. Ever since I saw and sketched the Ruby-crowned Kinglet on some cattails at Morris Arboretum in sketch below last week I've toyed with the idea of making a more finished work from it. 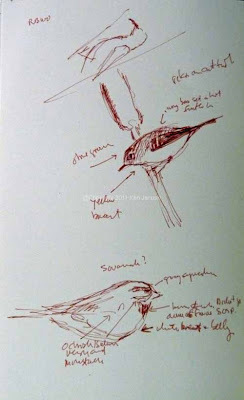 As I've mentioned for probably four years now Kinglets are very hard to draw in the field. They just don't sit still, at all!!! Almost as though they get paid by the flit. 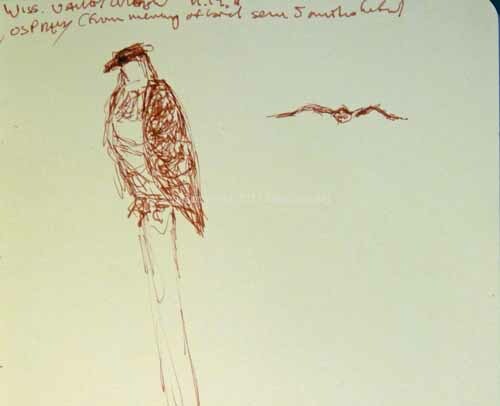 So the sketch above is really more from memory than from looking at the bird. I had just seen the bird but it was gone before I could put it down. So this is drawn from a mental image. That in turn is partially formed by all I've learned over the years in sketching Ruby-crowned Kinglets. I have to keep reminding myself that the wingbars start further back than I expect them to, etc., etc. The pose on the cattail was also from memory. 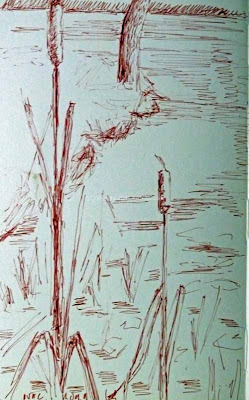 Most cattails stand straight so already there's somehing a bit off in the sketch. But it did serve as the impulse to keep thinking about a more finished work with this subject. Yesterday we spent much of the day at Peace Valley Park in nearby Montgomery County. We only get there about once a year. Yesterday's promise of sunny weather in the high 60s AND a selasphorous hummingbird seen the day before were enough to convince us to give it a visit. The hummingbird had not been seen since the day before and we didn't see it either. There were six Ruddy Ducks and lots of gulls but other than that the only surprise was a late season Gray Catbird. But there were cattails! There is a lovely pond in front of the bird blind there. We sat for awhile and sketched cattails. 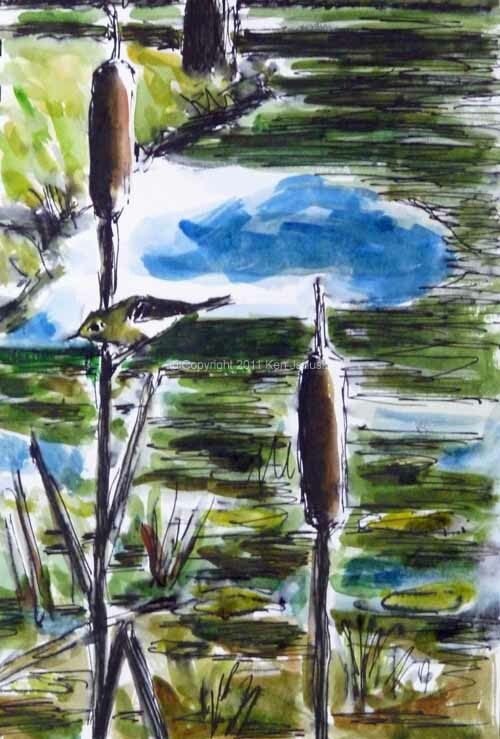 Ever since I'd done the sketch of the kinglet and cattail I've regretted that I didn't take some cattail photos for reference. So when we found some right in front of us it seemed the perfect time to make sketches and take a couple of photos. This morning I tried to put all that together in the ink and watercolor above. This one is done on paper from the Stillman & Birn Beta series of sketchbooks. It's similar to the Delta series in that it's a very heavyweight paper. The difference is that this is natural white rather than ivory. Both have proved very useful for this type of quick sketch that includes a fair amount of water. As usual I'm finding this method of ink that runs when water touches it and a bit of watercolor on this paper to be a good way to work through ideas for more developed work. I'm still not sure that I can pull off a painting based on this theme. But I'm definitely toying with the idea. A few hours after posting this I had decided to just make an acrylic from this idea. At top is the result of the first few hours work. I'm sure there's still much more to do. I'm happy to say it's based largely on sketching from life and only minimally on photos I took. In any field there are acronyms that often mean a lot to the few people that are interested in that particular subject but often are meaningless or actually sound like pretentious nonsense to others. I used to work in IT and as you can guess there were so many in that field that you could almost construct entire sentences of just acronyms - not that anyone in their right mind would want to. As I've mentioned on and off over the years of this blog's existence I've struggled to combine my so-called 'fine art' background with wildlife art. I put 'fine art' in quotes because to me there's a false but nonetheless existent dichotomy in the art world between the two. If you doubt this actually occurs in practice ask yourself how many paintings with wildlife as subject you've seen in museums. It is almost unheard of to find contemporary wildlife art shown in museums. I think this is both silly and harmful. But it's also a complex situation. There's much wildlife art I don't like. It's cute, or formulaic, or slavishly photographic. So I've always felt myself much on the far outskirts of wildlife art. And yet there's no reason at all that it shouldn't be the subject of contemporary, high-quality art. When I started using birds as subject five or six years ago I could find extremely little contemporary art with wildlife as subjects that I liked. But slowly I found a few people. And then I found a lot. A huge number of them could be found at one place: SWLA. So for me this is an acronym that packs quite a punch. It exemplifies, particularly in the work of many of its members, what wildlife can accomplish and what it should aspire to. 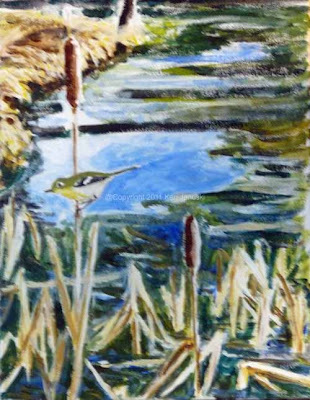 SWLA stands for Society of Wildlife Artists. For years I've looked through the work of its members and admired it. When I can afford to I've bought books of their work. For others I'm waiting, eagerly, for their first books to be published. It is based in London but accepts international members. There is also an annual competitive show, called as of last year I believe, 'The Natural Eye.' The 48th annual exhibition is on exhibit now in London. I applied for it a number of months ago. I thought it would be difficult to get into, not to mention difficult to figure out how to ship. Because of the costs of shipping though they allow international artists to apply first with digital images. If they are pre-selected then they need to ship their framed works for the show and go through a final judging. My work was pre-selected! So I created new mats and frames and figured out how to ship it there, without truly extravagant costs. But I didn't anticipate customs, something I've never really dealt with. To make a long story short the prints were still in customs on the day of final judging. I gave up on being in the show. Then a few weeks ago I heard from Mall Galleries that the prints had arrived and would be in the show. I couldn't believe it! My prints hanging with some of the artists I most admire. I put a small notice at the top of my blog under 'About Me' that referred to it. But I didn't want to write about it on the blog until I knew for sure that the prints were hanging. A week ago I wrote that I was in two shows in one week, both with acronyms. This is the other one. So I looked for reviews after the opening last week. The best I've read so far has a number of photos. But it and other reviews all showed the work with light colored mats and light colored frames. Mine had neither. Was there a framing rule I'd missed that required them? Since even pre-selected work could be refused for improper framing I began to doubt that my work was finally in it. Today it was confirmed that it is and has been hanging at show for last week or so! I think I need to pinch myself in order to truly believe this. I only wish I could see the show myself. The review mentioned above states how high the quality is and also mentions that the printmaking is 'stunning.' I couldn't ask for much more than that, other than to actually see it. There is one more thing that would even be better: to have gone to the opening and to have met my online friends from the Wildlife Art thread of birdforum that are also in the show. The ones I know of are: Tim Wootton, winner of Birdwatch Artist of the Year award, Nick Derry and Adam Bowley. I don't think any of them were at opening and may not even get to show. But as I said that is the one thing that I could wish for to make being in the show even more exciting. And I've never seen their work, or the work of SWLA members, in person. I'd love to be able to do that, especially with mine hanging somewhere nearby. I had to choose an illustration for this post. I could have chosen two prints that are in show but I've shown them before. One in fact is now the header image for this blog. That's the Blackburnian Warbler. 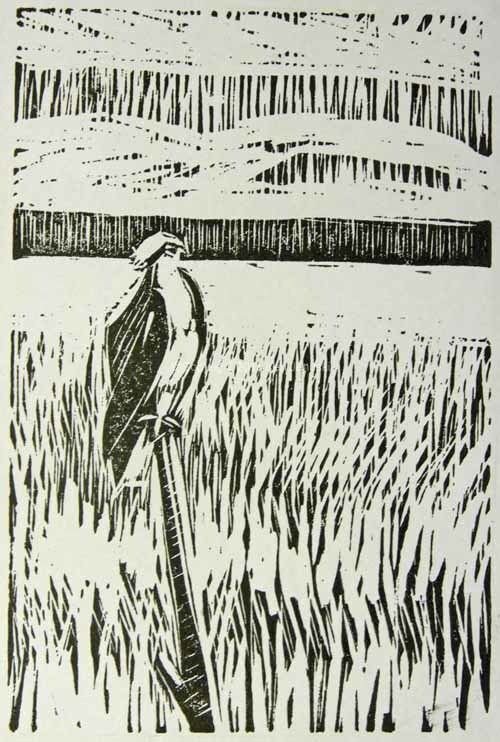 The other print is the black and white linocut of the Louisiana Waterthrush and Ebony Jewelwing. But since I've nearly finished the newest lino I decided to show it instead. It's at a point now where every little change makes a difference. I think it's done, outside of printing an edition on good paper. But I need to let it sit for a day of two to make sure it's done before printing an edition.